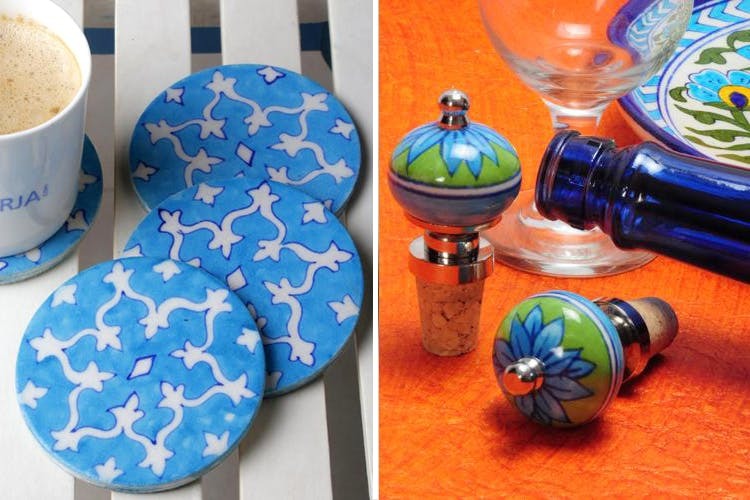 From door knobs to quirky tea sets, we are loving Neerja International’s beautiful Jaipur blue pottery wares. And all of this is also available right here in the city. While Jaipur might be known as The Pink City, another colour in particular caught Leela Bordia’s fancy and that was the striking blue of the traditional blue pottery created by the artisans of Jaipur. Saddened at their livelihood, she wanted to save this craft and provide a better life to the artisans. So she started Neerja International — a company that supports blue pottery artisans, giving them a platform to showcase their work. The proceeds go to supporting the revival of this art form as well as the families of these craftsmen. Creating designs to keep up with the trends, the blue pottery collections is an ode to ceramic art with collections that will look fantastic anywhere in the house. From intricate coasters sets that start from INR 600 to decorative platters depicting florals, elephants and peacocks. We also love Neerja International’s quirky cabinet and door knobs that are come in pastel greens, inky blues and summer yellows, all with the signature blue as a backdrop. We even love their painted blue wine bottle stoppers, with spiral patterns and their photo frames that come with a delicate floral border. The collection extends to boxes of all sizes, aroma diffuser stands, card holders, candle holders, mirrors, tea sets and even jars. The collection also offers Tic-Tac-Toe games and Brain Vitas (remember that retro board game with a bunch of marbles where you had to end up with just one marble), which are beautifully handcrafted in ceramics with Persian blues and floral work. Neerja International’s pottery collection is available online and supplies to a few stores in the city, like Ceramique in Kumara Park West and also Jute Cottage in Indiranagar with a slightly limited collection. If you are visiting Jaipur, you are most welcome to visit Neerja’s facility, where they will give you a tour of their company, craft and history.